I’m approaching the 60,000 hits mark. I’m so shocked by all the kind comments you all leave me. With the holidays right around the corner, I wanted to show my appreciation by giving someone the opportunity to win some awesome candy. Not that bad of a sketch for a first timer right? I had to use some of my new goodies for this one. I used A Beautiful Thing stamp set and Bali Breeze DSP for this sample. 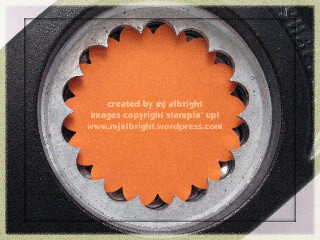 The card base is Purely Pomegranate CS 4-1/4″ x 8-1/2″ folded in half and corners rounded with my 3/16″ Corner Rounder Punch. Next layer is Pumpkin Pie CS 4-1/8″ square with corners rounded. Final base layer is a 4″ square piece of DSP from Bali Breeze with corners rounded. The green piece of paper running horizontally is a 2″ x 4″ piece of Bali Breeze DSP. Layered a 1-3/4″ x 4″ piece of Vellum on top of this. Added some paper-piercing to the right side. The main image is a 2″ x 2-3/4″ piece of Whisper White CS. 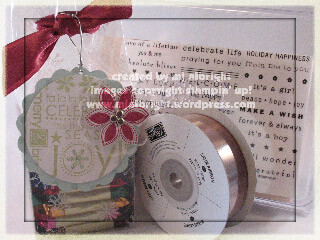 Used Pumpkin Pie, Taken With Teal, Old Olive, and Rose Red Stampin’ Write Markers to the sentiment and stamped. 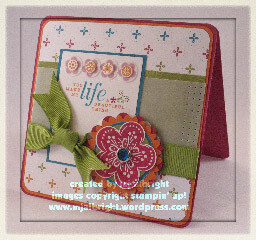 The 4 flowers (2-step stampin’) along the top of the sentiment were first stamped in Purely Pomegranate ink, layered a Vellum circle punched with my 1/2″ Circle Punch, then added the Pumpkin Pie ink stamped flowers to the insides with a Mini-Glue Dot. Adhered to card base. Added 5/8″ Old Olive Grosgrain Ribbon. 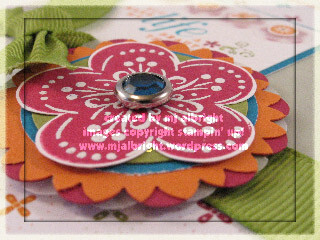 The medallion is 6 layers of cardstock with a Ice Circle Rhinestone Brad in the center. Going from back to front: Scallop Punched Vellum; Scallop Punched Purely Pomegranate; Scallop Punched Pumpkin Pie 2 times (see pic below); 1-3/8″ Circle Punch to a Piece of Bali Breeze DSP; 1-1/4″ Circle Punch to Old Olive CS; Stamped the flower on Whisper White CS with Purely Pomegranate ink, 2-step stamped the details of the flower with Versamark Ink and added White Embossing Powder, cut out and attached; added Rhinestone Brad. All you have to do is make a card with the sketch that I provided above. Post your comment with the link to view your card. I’m going to keep this open until the beginning of January due to all of our busy schedules. I will use Random.org to pick the winner and will post this probably in the first week of January. Hope you all play. Can’t wait to see your creations:)…. AND GOOD LUCK!!! I love it! I will have to try your sketch! I always love seeing your stuff both on your blog and in SU publications! You are so talented! 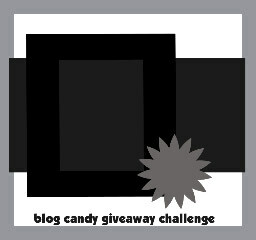 Thanks for the blog candy and Happy Holidays! beautiful card! love the way you made the medallion! this is such a cheerful, happy card to see while I have snow falling like crazy outside my window! 🙂 congrats on the many hits – but not such a surprise really! 😉 wink, wink, wink! Thanks so much for posting the dimensions of your card, layers, etc.! It helps so much when following the sketch. I have yet to mount this set and this is one of the best inspiration pieces I have seen for it. What you’ve done with that scallop punch is why your so good. You ARE a famous girl! Cant believe you still dont know that. The card is absolutely gorgeous…I love what you did with the punch – great idea!!! And also I want to say CONGRATS on your 60’000 hit – WOW that’s super cool!!! Happy Holidays…. I need a button on my keyboard that says “fabulous, I love it, amazing…” so I can just hit that everytime I comment on your work! You never disappoint! The sketch is wonderful…but your card is brilliant!!! Absolutely gorgeous! Awesome sketch girl!! I’ll have to give it a shot….time permitting of course!!! WOW, you did it again!!! Left me speechless with this amazing card!!! (My DH loves when I check out your blog!!! LOL!!). This card is truely amazing and I love what you did with the scallop punch!!! Keep up the awesome work!! Congrats on the hits! I love your blog and your cards are gorgeous! I wanted to try the sketch but I didn’t realize how much space I didn’t have…so I hope this still meets the “sketch”. I’m still really new to the stamping world (since Oct) so how much room I have on a sketch still confuses me a touch. Thanks for hosting! Yeah I was able to get one done. Great sketch and congrats on the mega hits!!!! Feliz Navidad in english is Merry Christmas, so have a wonderful “Feliz Navidad”. Beautiful cards! Love your artwork. Thank you for all the inspiration you give to the stamping community! OMG…you are genius with making that flower!!!!!!!!!!!!!! I am so not surprised that I am seeing this here!! Great sketch. I will definitely use it in the future!! Good luck to all those that enter!! Your sketch looks fantastic! Love that flower! Thanks for sharing your tips!!! This is a great sketch, MaryJo… and your card is beautiful, of course! I’m hoping to do this. I’ve been so behind in my blog reading, so I’m just now seeing this! How fun! I may end up playing more with this sketch, it’s so fun! Hi Mary Jo! Congrats on your 60,000 hits… OMG!! Your card its beautiful and I love the sketch! So I tried it and love the results! I never used a sketch for a card before and It was just awesome! Happy Holidays!! Oh wow! What a gorgeous card and such a creative idea with that medallion!!!!! Love it! FANTASTIC card…hope to get to your challenge after Christmas. I’m so excited that I stumbled onto your blog….lucky me!! MERRY CHRISTMAS! Man, that is beautiful! Thank you so much for showing us how to “double-punch” to make such a beautiful medallion background. This is a totally gorgeous card! Love how you used that punch, and congrats on your WOW Art File winner–can’t wait to see it! your stuff is always stunning! I wanted to share with you how I turned my punch piece to punch it again, after much faffing I cut a strip of copy paper and then tiny bit of glue to stick it onto that and then I used that to guide and move it! My mojos not around much right now… if I feel able I might take part in your sketch..
Oh and I wanted to add to me you are one of those WOW stampers, right up there in my opinion!! Beautiful card and I am going to try to get some time to do this challenge. Congrats on so many hits !!! Thanks MJ for a great sketch! I’ve loaded mine to my blog. Oh, Mary Jo! I FINALLY got that punch in yesterday’s mail!!! Thanks for showing me a new trick, and for this wonderful sketch. Hopefully I’ll get a chance to play with it some time this weekend. And, by the way, I think YOU’RE getting pretty famous for being such a fabulous stamper — at least you are in my book! : ) HUGS! Congrats on your milestone hits, Mary Jo! Your artwork is exceptional, and your blog is awesome! Thanks so much for the fun sketch! Happy New Year! I just found your blog after looking at Dawn Easton’s blog and her great card! I hope I have time to play! By the way, love your blog, you’re bookmarked so I can come back for frequent visits. Your projects are AMAZING = ) ! Adorable card! My mom and I did your layout last week when she was visiting but I can’t post a pic because my camera is on the fritz! Just wanted to say thanks for the great tip and nice layout! Have a happy new year! A beautiful card, and a very fun sketch! I’ve made 2 cards based on it so far…will upload the second later today. Thanks for the fun!! The card is so pretty. Love the embellishment flower. Just wondering if so many layers would fit in an envelope. Guess I will have to try it and see. Keep up the good work. Here’s mine- Thanks for the opportunity! I love this card, and the medallion is so unique! I have a new stamp set and new paper that will be perfect for your sketch (and it’s a great one I might add!). I will email you my photo for you to see as I don’t have a website at the moment. Happy New Year to you and all your viewers. Best wishes for a stampendous 2008! Thank you so much for posting how to reinsert a punched piece into the punch! I love your card and this practical – doh! – tip would, possibly, some day, maybe have crossed my mind, but not anytime soon! Beautiful card. I’m going to have to try that punch trick. Ingenious!